This week we look at a keeping good company with Jesus in marriage and family life. After passing my 32nd wedding anniversary recently, I hope you don’t mind if I opine at length on some of the wisdom I’ve gained from the graces found in the Sacrament of Matrimony. 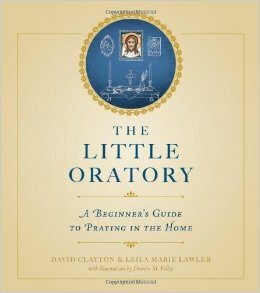 In keeping with the gift of the home and family life, I’m also thrilled to be sharing an extended conversation with author and blogger Leila Marie Lawler about the book she co-wrote with David Clayton, The Little Oratory: A Beginner’s Guide to Praying in the Home. We discuss making prayer the center of your daily family life by establishing a home altar, or little oratory, as a place to start celebrating the gift of the liturgical year in our families. This episode also introduces the inspirations from the little known mystic-saint, St Umilta (or St Humility). Enter the drawing for to receive a signed copy of The Little Oratory! Send your name and comments to Pat Gohn at amongwomenpodcast@me.com, or to the Among Women podcast facebook page. Or leave your feedback in the comment box below. All entries must be received by midnight EST, November 10, 2014.